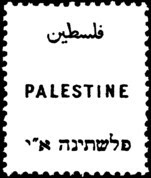 Less than a year after the first London overprints were issued ("London I"), the Palestinian postal authorities changed suppliers for stamps: Since 1918 all stamps had been printed by the Stamping Department of the Board Of Inland Revenue, at Somerset House, London). Via Crown Agents the entire contract is placed with commercial printers Waterlow & Sons, Ltd. in London. Some values change colour and new values are added. Waterlow uses paper regular to Crown Agents stamps: with watermark W9 (Multiple Script CA). Apparently some batches of paper varied in thickness. Perforation shows uniformly as K14, though some higher values were perforated K15:14. The height of the stamps is 24mm. The arrangement of the printing sheet remains unchanged: two panes of 120 stamps (12x10 fields) with a horizonal row of Intersecting Gutters in new type B. There are now double Jubilee Lines: in the colour of the stamp plus the colour of the overprint. Early prints show plate numbers ("Plate No. 1") in the margin; later prints have only a numerator. Copy of SG no. 72 from the top row of the bottom pane with intersecting gutter (new type B). Block of four from the top left corner of the top pane in the printing sheet, showing plate number and the two jubilee lines. Images courtesy of Rolf Wernecke. Picture postcard with SG no. 74. 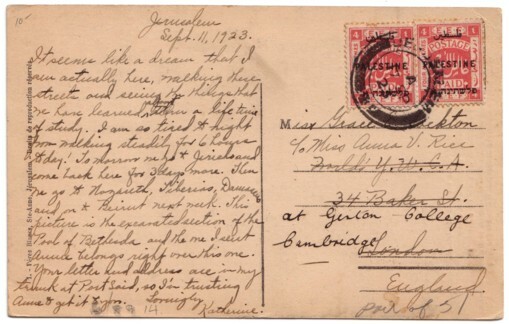 Cancelled with JERUSALEM / A / 17 SP / 23 (Sacher B25); destined for London and forwarded to Cambridge. SG no. 81 as perfin: "K.K.L." in Hebrew letters, position C.
SG no. 81 with inverted overprint (Bale 81a). The expert philatelist recognises four plate arrangements, some appear only with some values, which lead to 21 discernable types. For the overprint, two plates (A, B) were used, the latter appears clearer and has thinner type in the second line. inverted or horizontally misplaced overprint, double overprint. Commercial cover with SG no. 80, cancelled with BETHLEHEM / A / 28 JU / 26 (bad strike); destined for Landshut, Germany. 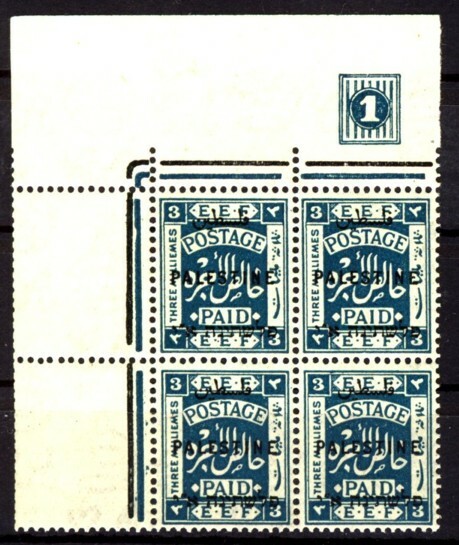 Registered commercial cover with SG no. 80 in vertical pair. 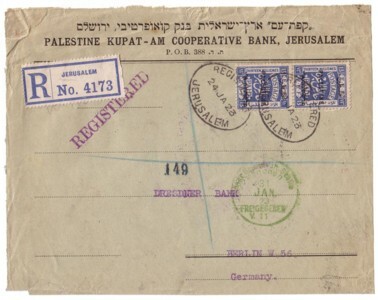 Cancelled in Jerusalem: REGISTERED / JERUSALEM / 24 JA 23 (Sacher). 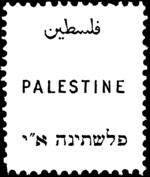 Registration label JERUSALEM / No. 4173 (Sacher). German customs inspection mark Post Überwach. Stelle / München / FREIGEGEBEN / V. 11 / 31 / JAN. / 23. Delivered to Dresdner Bank, Berlin. 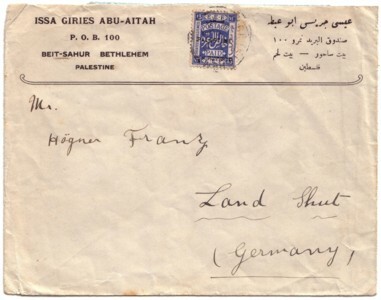 Registered letter from Haifo to Germany. 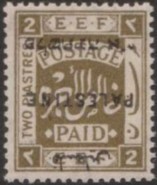 Postmark: REGISTERED / HAIFA / 16 FE 26. The double franking of SG no. 81 covers 13m for registration, 13m standard foreign letter rate and 2x7m for additional weight upto 60g. 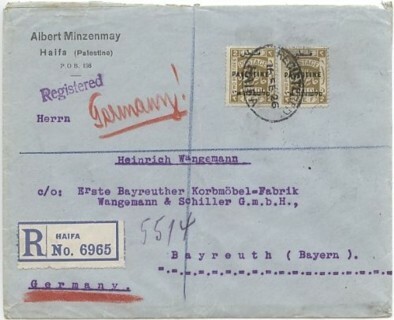 Registation label HAIFA / No. 6965. On reverse arrival mark BAYREUTH 2. / b / 23 / FEB. / 26 / 5-6 N.
Envelope PT366, used in March 1926 by the Jerusalem Accounts Branch & Registry (cachet similar to Sacher 23 or 24) for a registered letter to Detroit. Horizontal pair of SG no. 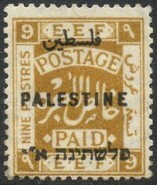 80 (13m) cancelled by REGISTERED / JERUSALEM / 30 MR 26. Registation label JERUSALEM / No. 8228. 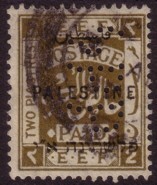 The specific characteristic of this issue (especially to delimitate it from the Somerset stamps London II) is -- apart from changes to colour, watermark and perforation -- the short and blurred inverted commas (dashes) in the third, Hebrew line. 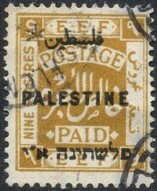 The stamps were issued, according to demand, between August (some sources list September) and November 1922. Definitive first days are therefore not known. The circulation figures (print-runs) are taken from Bale.